L = 8780 mm; diam eggshell beads = 3.2 to 6.5 mm, th = 2 to 3 mm; diam snail shell beads = 4 mm; diam stone beads = 4.5 mm, th = 3 mm; L hide segments = 4 to 7 mm [RTS 23/8/2004]. Collected by Percy Horace Gordon Powell-Cotton and his wife Hannah Powell-Cotton (nee Hannah Brayton Slater) on 3rd May 1933 during a shooting expedition. Very long string made from 2 strands of hide twisted together and knotted at the top and again part way along the body; the string has broken in two places, one of which has a modern mend while the other has been left loose with the end beads glued in place. 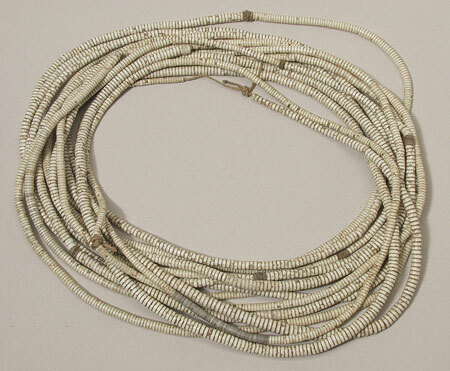 This cord has been strung with a series of small opaque white disc beads, chipped from pieces of ostrich shell and polished around the outer edges. These vary slightly in diameter, from 3.2 mm to 6.5 mm, and in thickness from 1 to 2 mm; they have been strung so that beads of similar diameter are positioned together, with the size gradually increasing from either end towards the centre of the string. 9 slightly thicker opaque white stone beads have been strung alongside the ostrich eggshell examples, in 1 group of 4 beads and 2 groups of 2 beads each; these have diameters of 4.5 mm and are around 3 mm thick. There is also one short section, 56 mm long, that has been strung with a group of thin achatina shell disc beads. These are varying shades of grey and cream (Pantone Warm Grey 6C, Cool Grey 1C), and have diameters of 4 mm. Finally, there are 10 'spacer' sections that seem to be made of brown animal hide, either as a string wound around the central thread, or as a series of small discs strung together. These occur at intervals between the eggshell beads, and are between 4 and 7 mm long. The string is a mid brown colour (Pantone 7508C), and has a total length of 8780 mm. The necklet weighs 315.8 grams. Collected by Percy Horace Gordon Powell-Cotton and his wife Hannah at Fanamweir on 3rd May 1933, during a shooting expedition. They give the Dinka name for this type of object as wut, but according to Nebel, wut means ‘ostrich’, suggesting that the word actually refers to the material from which the object was made, not the object itself (Nebel 1979, Dinka-English Dictionary, p. 95) . Carey suggests that ostrich eggshell beads were made by chipping the material to the correct size then boring a hole through it, after soaking the eggshell in water to prevent the material splitting. Several partially worked beads could then be strung together and the edges ground to finish them off. It was possible to make around one hundred beads of this kind per day (M. Carey, Beads and Beadwork of East and South Africa, 1986, p. 9). Achatina is a species of gastropod; the three main varieties are Achatina fulica (East African land snail), Achatina marginata (West African Land Snail) and Achatina Achatina (Tiger Snail). The Achatina fulica is the smallest of these, with a shell 3-4 inches in length (Source: http://exoticpets.about.com/cs/rarespecies/p/landsnails.htm). This object is currently on display in the Upper Gallery, case 26A. Accession Book Entry [p. 248] 1934 [insert] 8 [end insert] - MAJOR P. H. G. POWELL-COTTON , Quex Park, Birchington, E. Kent. Specimens collected by himself & Mrs Cotton, during hunting trips, 1933, viz: - From the DINKA tribe, FANAMWEIR & KORNUK, WHITE NILE [...] [p. 250] [insert] 24 [end insert] - Wut , man’s necklet of ostrich-egg-shell beads, ib[idem] [FANAMWEIR] (2264). Additional Accession Book Entry [p. 249] - 1934.8.24 No given AP. Card Catalogue Entry - There is no further information on the catalogue card [RTS 9/3/2004]. Related Documents File - Typewritten List of "Curios Presented to Dr. Balfour by Major & Mrs. Powell-Cotton. Dinka Tribe". This object appears as item 2264: "Ostrich egg shell bead necklace, man's, 11 strands, native name Wut , 3/5/33 Fanamweir, 8.55 N, 28.42 E". Also contains details of a cine film 'some tribes of the Southern Sudan', taken by Powell-Cotton during this 1933 expedition, copies of which are now in the National Film and Television Archive and the Powell-Cotton Museum in Kent [RTS 14/3/2005]. Sparks, Rachael. "Dinka necklet" Southern Sudan Project (in development). 03 Jan. 2006. Pitt Rivers Museum. <http://southernsudan.prm.ox.ac.uk/details/1934.8.24/>.